The new and improved Type-C Hub is here. Still offering everything you loved from our Type-C USB 3.0 Hub, the Pass Through USB Hub now offers a USB-C Port enabling your MacBook 12" to be charged while the adapter is plugged in. 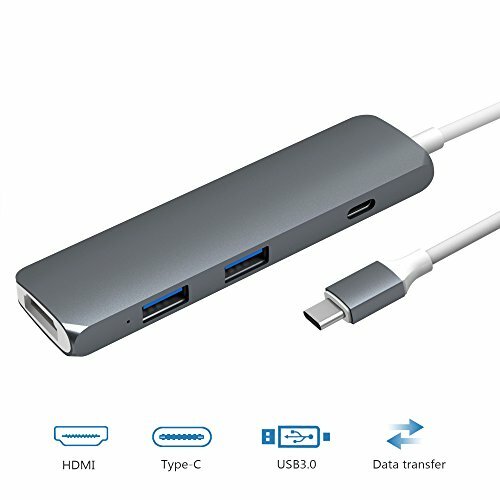 Thanks to the Cateck Type-C Aluminum 3 in 1 Pro Hub Adapter, you can charge your MacBook as well as easily convert a Type-C USB port to 4K HDMI port and two USB 3.0 ports. Use the Adapter's 4K HDMI port to output video from your computer to a 4K monitor. If your computer supports 4K you can enjoy beautiful, crisp high-resolution displays by simply connecting an HDMI cable from your Multi-Port Adapter to a 4K monitor. Don't worry about sacrificing your Type-C port, with the included pass-through port, you can easily charge your Type-C device while using the other included outlets. With two USB Type-A ports on fast 5Gb/s data speed, the Adapter has plenty of room for your additional peripherals. The small size makes the Type-C USB Hub Adapter easy to fit into a purse, backpack, or laptop bag. No matter where your travels take you, you won't be far from the convenience of accessing your favorite USB devices! Compatible well with Windows10, Google Chrome OS, Mac OS X Yosemite, Mac OS X EI Capitan, Mac OS sierra, etc. Designed for New Compatible Type-C Products : Including new 12" MacBook, as well as other USB Type-C devices; Compatible well with Windows10, Google Chrome OS, Mac OS X Yosemite, Mac OS X EI Capitan, Mac OS sierra, etc. Best Companion: The super slim and compact design make it simple to take the Type-C USB Hub with you anywhere you go.